We didn't quite expect to get not one, but two, Elder Scrolls games announced tonight. Of course, everyone is ridiculously hyped about Elder Scrolls 6, but actually the other ES game, Elder Scrolls Blade is going to be a brilliant stopgap. This game is built specifically for mobile, and seems to build on the successful control scheme Epic Games perfected with its own mobile title, Infinity Blade. It's coming to Android and iOS simultaneously (unlike what Bethesda did with Fallout Shelter) this fall, but you can pre-order now. 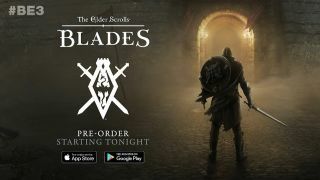 In The Elder Scrolls: Blades you play as one of the "empire's top agents", who returns home to find its been destroyed. You're forced into exile, and you'll be exploring hand-crafted and procedurally generated dungeons as you play. The control scheme allows you to attack and move using taps or virtual dual sticks - even in one-handed, portrait mode, which is basically unheard of for a mobile RPG. You'll be trying to upgrade and enhance your custom-made character, but also trying to rebuild your ruined town to create your own virtual city. Oh, and have we mentioned that it looks amazing? This is quite the mobile game. Although this is currently just a mobile release, there's a plan to eventually launch Elder Scrolls Blades for PCs, consoles, and virtual reality devices too. If you're interested, you can pre-register via the official website: playblades.com. Be sure to check out the E3 2018 schedule to see when the other major players will announce their news, and keep an eye on our list of E3 2018 games to see all the titles coming your way.